We're giving you a look inside the pages of our May issue weeks before the stories are published online. 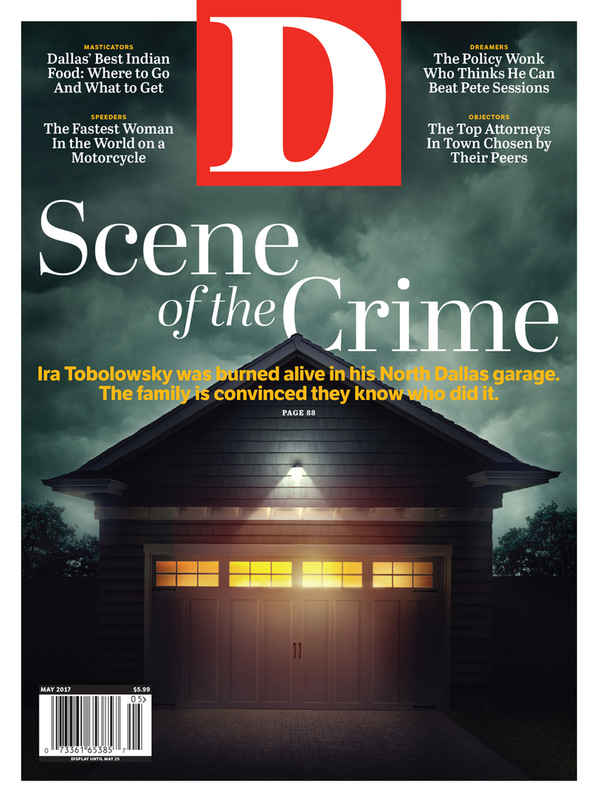 Beginning today, you’ll see the May issue of D Magazine rolling out on newsstands. That’s it on the left. 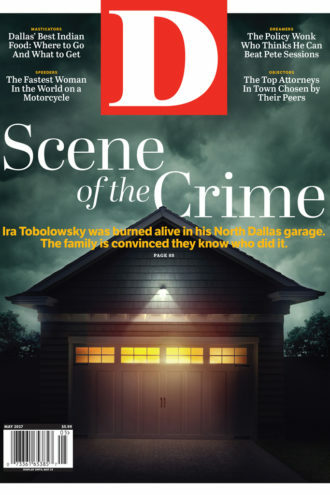 The name Ira Tobolowsky figures prominently on the cover. I’m willing to bet many of you remember that name. For one, Tobolowsky was a highly regarded attorney who operated for decades out of a small office on Lovers Lane, west of the Tollway. And two, he was burned to death in his North Dallas home just under a year ago, and police have still yet to charge anyone with the crime. “Ira was definitely the type of person who had more personality than you could imagine. He was hands down the smartest person in the room, no matter what room he was in. He was caring, he was affectionate, he was a loving guy. He really was a perfect combination of all the good attributes you would want in a husband, father, friend, everything. He was amazing. Our dining critic, Eve Hill-Agnus, has a pair of important pieces—a review of famed restaurateur Nick Badovinus’ opulent temple to beef, Town Hearth; and a guide to the finest regional Indian food in Dallas-Fort Worth, a trip that will take you well beyond biryani and butter chicken. Meanwhile, Michael J. Mooney returns to the pages of D by asking attorneys to explore their most memorable divorce cases. He gets dirt on murder-for-hires, pastor-punchers, stalkers, and more. In the front of the book, Peter Simek chronicles the troubles of the Fort Worth Opera, and city columnist Eric Celeste has an exclusive profile of the Democrat policy wonk who is convinced that he can knock Pete Sessions from his longstanding congressional seat in District 32. There’s something for everyone. Get to your favorite local newsstand now.